Comfort Inn Hyde Park London Hotel invites travellers with a warm welcoming atmosphere into the elegant interior of a hotel situated in a quiet street lined with shady green trees, yet located only within minutes from <?xml:namespace prefix = st1 />Oxford Street and a variety of shopping, entertainment, recreational and dining venues of infamous Hyde Park London. 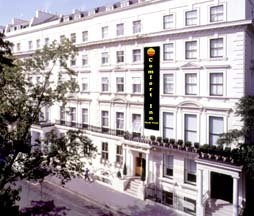 Convenient, comfortable and affordable, Comfort Inn Hyde Park London Hotel features the ideal retreat for any traveller, whether they are in London for business or leisure. Speaking volumes about the quality and personalised attention provided for the esteemed hotel guests, Comfort Inn Hyde Park London Hotel features 60 deluxe guest rooms fitted with colour television, radio, direct dial telephone and many comforts of home and additional amenities. Ideally situated within minutes from London Underground and Mainline Stations with a direct link to Heathrow and Gatwick Airports, Comfort Inn Hyde Park London Hotel is an excellent option for accommodations while in London. Serving delicious complimentary breakfast daily, the Breakfast Room at Comfort Inn Hyde Park London provides a convenient morning meal option for the hotel guests as a value added service. Hotel Bar, the onsite lounging facility of this London hotel serves cocktails and treats from 5:00 pm to 1:00 am. Nearby restaurants in the Hyde Park area and Oxford Street provide a range of cuisines for hotel guests to enjoy. Several renowned London area attractions located nearby to Comfort Inn Hyde Park London Hotel include Buckingham Palace, Earls Court, Hyde Park, Kensington Palace, London Toy Museum, Madame Tussauds, Marble Arch and Oxford Street. Featuring 60 guest rooms and a few two or three-bedroom suites, Comfort Inn Hyde Park London Hotel is a mark of quality, convenience, comfort and affordability in the heart of London.